Veterans Affairs Canada raised pensions, awards and allowances paid under the Pension Act by 0.9 per cent in 2014. 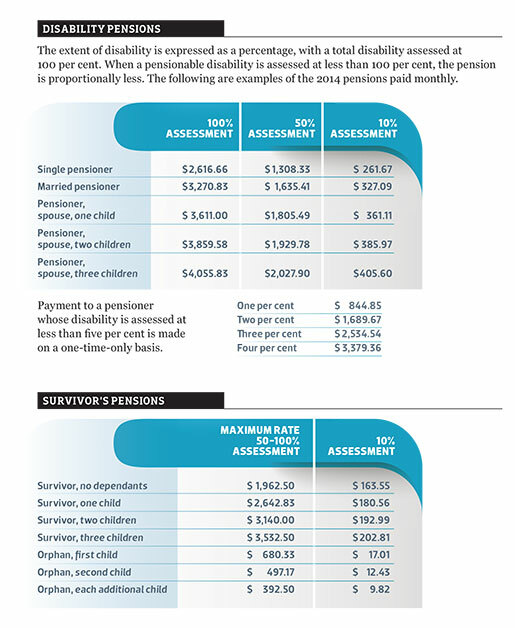 VAC adjusts the rates for disability pensions and allowances on Jan. 1 each year. The amount is based on the Consumer Price Index in accordance with the Pension Act. A non-taxable benefit for totally disabled benefit recipients who need an attendant to help with self-care such as dressing, eating and bathing. Lawyers within VAC who provide free legal help for people who want to appeal decisions about disability benefit claims. Financial support for those who have completed the rehabilitation program but are unable to find a post-military career or job or have a low-paying job. 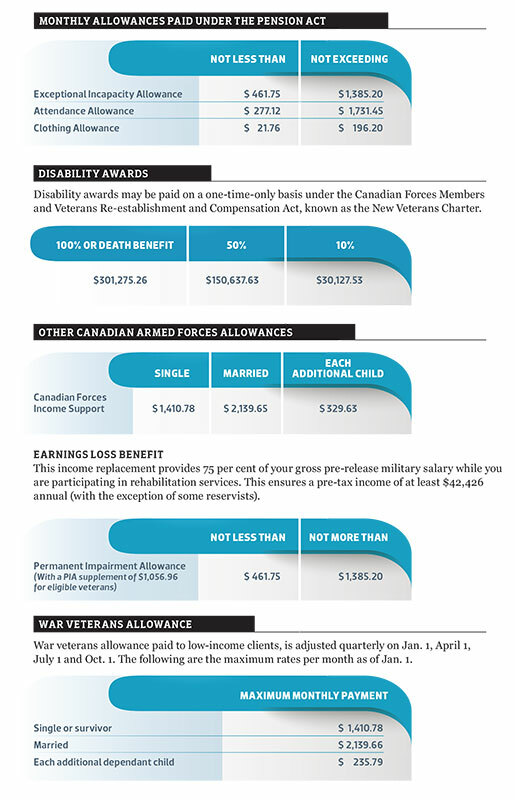 The legislation covering CAF members and veterans applying for benefits for illness or injury related to military service since April 1, 2006, also known as the New Veterans Charter. Is available to CAF members, veterans, RCMP members and their families dealing with a crisis, who have complex needs, or are having trouble making the transition to civilian life. Case managers have access to medical and rehabilitation specialists and other support services. A non-taxable benefit for either specially-made clothing or for a condition that causes exceptional wear and tear on clothing. Is based on severity of the medical condition and how much it affects quality of life. A tax-free cash award (commonly called the lump-sum payment) for CAF members or veterans with an injury or illness related to military service. It can be paid as a lump sum or in instalments. The award is adjusted for cost of living annually. A monthly tax-free payment for disabilities caused or worsened by service in the Second World War or Korean War; merchant marine or some civilian support occupations during wartime; by current RCMP members and veterans; and by Canadian Armed Forces members and veterans who applied for benefits prior to April 1, 2006. Insures compensation for loss of income of those in the rehabilitation and vocational assistance programs does not fall below 75 per cent of pre-release military salary. Provides financial assistance for four years of post-secondary education for children aged under 25 of a CAF member or veteran who died as result of military service or who was receiving disability benefits rated at 48 per cent or more. Policy used by VAC adjudicators in determining entitlement to disability benefits. The guidelines help determine if there’s a link between a medical condition or disability and a claimant’s military or RCMP service. A non-taxable allowance for recipients of disability benefits (including prisoner of war benefits) of 98 per cent or more and is based on shortened life expectancy, pain and loss of enjoyment. A percentage rating based on the severity of medical condition and degree to which it affects daily activities. It is added to the Quality of Life rating to determine disability assessment. See Canadian Forces Members and Veterans Re-establishment and Compensation Act. The legislation governing benefits for service-related illness and injury to veterans of the Second World War and Korean War, merchant navy veterans and certain civilians with wartime service, members and veterans of the RCMP, and CAF members and veterans prior to April 1, 2006. A monthly allowance for lost job opportunities due to permanent and severe impairment. Is determined by ability to live independently, maintain relationships, take care of oneself and participate in community activities. Is a measure of how much a medical condition has affected quality of life, rated on a scale from 1 to 3. Is available to injured and medically released CAF members and veterans who need medical or psycho-social rehabilitation or assistance in training and searching for a post-military job or career. The Service Income Security Insurance Plan provides replacement income for CAF regular and reserve members medically released due to long-term disability. The plan includes a vocational rehabilitation program. For the first year following death, spouses receive the full amount of the pensioner’s disability pension. After one year, spouses of pensioners rated at 48 per cent or greater disability continue to receive the full pension while spouses of pensioners rated between five and 47 per cent receive half. A list of conditions used to assess extent of a disability in order to determine eligibility and amount of benefits. Operated by Dominion Command of The Royal Canadian Legion, the bureau provides representation to those applying for VAC benefits, help in filling out and filing applications for benefits, and support through the application and appeals process, as well as benevolent assistance. The service is free of charge and you do not need to be a Legion member to receive help. Designed to help veterans remain in their own homes as they age, the VIP provides financial assistance for housekeeping, grounds keeping and personal care services to those receiving VAC disability benefits, their spouses and frail veterans on low incomes. Provides reviews and appeals of VAC decisions about eligibility and assessment for disability benefits. Provides financial assistance for low income Canadian, Commonwealth or Allied veterans who served overseas during the Second World War or Korean War, and their spouses. The amount provided is based on income, marital status and number of dependants. 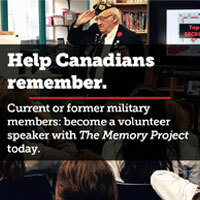 There are similar allowances for merchant navy veterans and civilians who worked in support of the military in wartime.